Patient room floors in 5 hospitals were often contaminated with health care associated pathogens. It was not uncommon for high-touch objects to be direct contact with the floor. 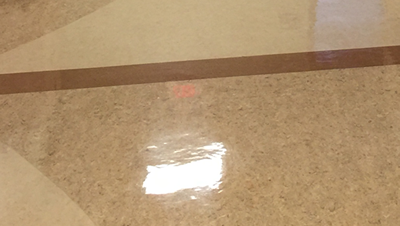 Floors in hospital rooms could be an underappreciated source for pathogen dissemination. In a survey of 5 hospitals, we found that floors in patient rooms were frequently contaminated with pathogens and high-touch objects such as blood pressure cuffs and call buttons were often in contact with the floor. Contact with objects on floors frequently resulted in transfer of pathogens to hands.